Solar Light’s Materials Testing Lab offers a variety of Reflectance Tests. 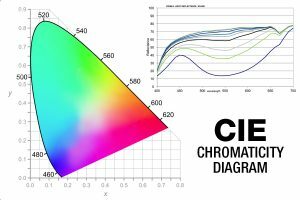 With our Visible Light Reflectance Test service, we may use any number of color coordinate systems, the primary being the CIE L*a*b* system. The Delta E value merges the overall color change into a parameter that provides a single overall value of change from the baseline. Where L*, a* and b* are the CIE colorimetric parameters such that the L * value indicates the Level of Light- Dark, the a* value Redness or Greenness, and the b* value Yellowness or Blueness. The delta E is always positive (or zero) and a value less than 2.0 is generally considered as a change of color that is less than what the human eye can distinguish. The Yellowness Index (ASTM E313) characterizes the amount of “Yellowing” on a scale of -100 (saturated blue to +100 saturated yellow).